Essay- Internet access chargeable or free? 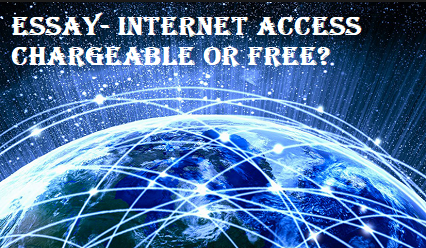 Internet access should be chargeable or should be free in this modern society? Discuss. The internet has brought a revolution in the digital world. It has changed the way businesses are done. The remote places of the world have been brought closer to us. All this has been possible because of the evolution of it. The big question should the internet access be charged or free in this modern society. The benefit of having a free internet is that it empowers the people. It upheld the universal rights of the people of having the freedom of speech and expression. It gives them an opportunity to express themselves and give their opinion on the wider platform. It promotes the business of small, medium enterprises. Their products can compete with the product of big companies. It has created new jobs and become a source of earning for many people. All this facility that internet is providing incurs some cost. The money is required for building the infrastructure for providing services. We all want our pages to be loaded within a second and messages to be sent instantly. This wouldn’t be possible if money is not invested in research and evolution of it. The prospects of going free will lead to privacy intrusions as our data can be utilised for monetising. Recently Cambridge Analytica has used the personal data of the user from facebook for channelizing the campaigns of political parties. The internet accesses should be affordable to the people. It should be neither charge too high nor be made free. It should neither be free as it provides employment opportunity for millions and nor be price high as every human being voice should have the right to express themselves.